THE MAHAL RUG - Beautifully-designed, yet rustically constructed takes on the classical village form. 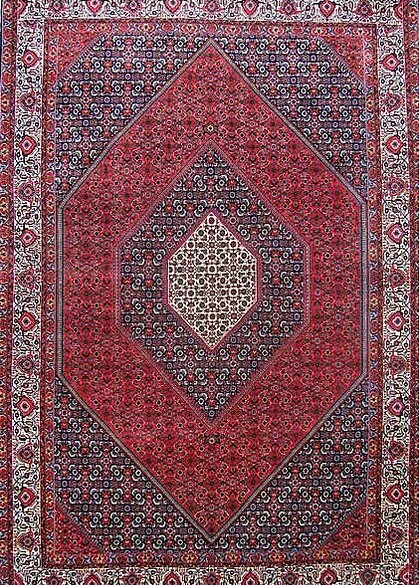 Extraordinary examples of the classic Persian village rug, Mahal carpets are recognized today as pinnacle achievements of the form, folk art masterpieces that have rightly assumed their small place in the Persian pantheon. These rustic, yet improbably elegant rugs are, among collectors and designers, some of the most popular village carpets on the market. Combined with the fact they were never produced on a large scale or in large quantities to begin with, it is little wonder that today they have become difficult to acquire internationally. Mahal is a provincial town, rural and relatively isolated, but critically, it lies directly on nomadic tribal routes that once connected the large city of Arak in the north to Persia’s vast provincial lands in the south. This geographic position—a kind of trade-route oasis—not only afforded Mahal access to the fine wools and dyes of nomadic peoples, it exposed the town to the extraordinary wealth of urban and rural designs that would ultimately become the backbone of the Mahal aesthetic. With time, synthesizing old styles to create carpets that were entirely new to the form, the provincial town of Mahal evolved into a small, unique rug-making center. 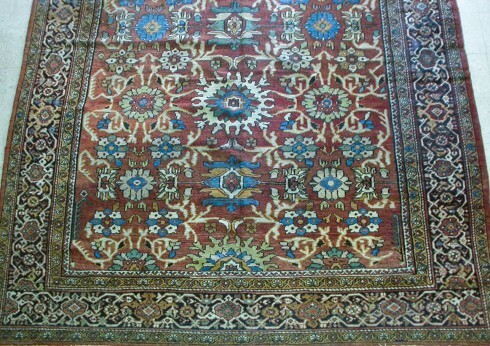 By the 19th century, it was producing rugs for the international market. Crucial to the development of Mahal’s unique style, the town always kept its rug production defiantly small-scale; even as the 19th century brought international attention (and money) to the region, weaving there never grew into the centralized, large-scale industry seen in regions of similar fame. Mahal rug production remained overwhelmingly the work of individual families, not workshops, and by sustaining traditional methods and intimate scale of production, the region’s weavers were able to produce what we now regard as some of the most charming, yet refined, rugs of their era. Still, the Mahal carpets were produced with business savvy, almost exclusively for export to Europe and America. 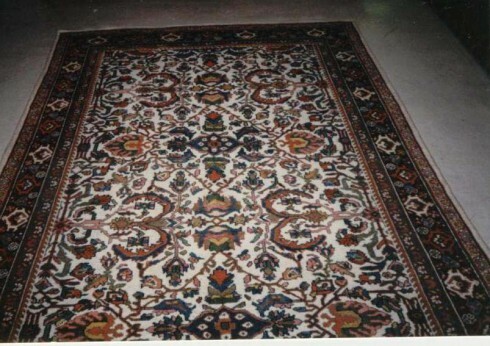 In fact, not only were the rugs produced for the west, in many cases they were actually contracted by it. In particular, the British firm Ziegler commissioned individual families of Mahal to create classically-inspired, one-of-a-kind carpets for its clients in England and France. Though the Ziegler Mahal rugs are the most famous examples, they are only one among many of the dealer-producer-made carpets that came to define both the market for, and the aesthetic of, Mahal’s textiles: beautifully-designed, yet rustically constructed takes on the classical village form. 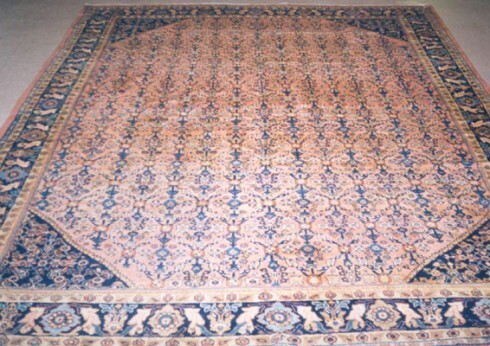 To refer to these rugs as examples of folk art is to suggest some degree of spontaneity and whimsy in their design, and indeed, Mahal carpets are valued for exactly this reason. They are most famous for their uniquely minimalist patterns, striking designs that strip away adornment and distill classical Persian motifs to their beautifully spare, elemental cores. Earth tones and clean pastels buttress this purposeful simplicity, and among the finest Mahal rugs, a famous ivory dye can be seen almost radiating light. If not fully improvised, these carpets feel at least newly-imagined, and perhaps that is at the heart of their contemporary appeal: Mahals, created in the 19th century, feel remarkably, even presciently modern.